So I was bothered by not knowing the right amount of solar panels and accumulators that I needed to keep my factory running, so I did some math to figure out the optimal number for any electrical network. The only input you need is the standard consumption of an electrical network (Watts) when not charging accumulators, henceforth referred to as P.
This will generate and store exactly the amount of power needed by an electrical network for every day. The accumulators will completely empty at exactly the time that the solar panels are able to run the network on their own. For the math, check below. The day/night cycle in Factorio can be found here. For half the day, solar power is 100% efficient. Performance decreases linearly on both sides for 20% of the day each, and they produce no power for 10% of the day. This makes the effective uptime of solar power 0.7 days per day, or 70% efficient. In this time, an entire day's worth of energy must be generated. Solar panels must generate the inverse of their uptime multiplied by P, which is P/0.7=1.43P. Solar panels generate 60kW of power each, so the amount needed is required power over the power each panel generates, or 1.43P / 60kW = 0.0238P / kW = 23.8P / MW. 1 W of every 1.43 W of solar power is used by the grid, the other 0.43 W is stored in accumulators. An entire Factorio day is 416.66 seconds. The effective time it is on solar power is 70% of that, so the amount of energy stored in a day is 0.43P*0.7*416.66 = 125.4*P seconds. Accumulators store a total of 5 MJ of energy each, but can only expend 300 kW of power. This is not a problem for the length of time that they have to discharge, for reasons I won't get into here. The number of accumulators needed is then the total stored energy over the storage of an accumulator, or 125.4s * P / (5 MJ) = 125.4 * P / (5 MW) = 20P / MW. I believe that all my assumptions are correct. If there are any mistakes or inconsistencies, please point them out so I can correct them. You'll probably still want a few more solar panels and accumulators if you're using laser turrets or expanding your factories. If you're making a remote radar or outpost that isn't expecting any power spikes, this system should be perfect. If a power spike does occur, the accumulators will run out of power before the solar panels can fully support the network, but the network will effectively reset every day at 79 seconds after midnight (when the solar panels can support the network independently), so there should be no long term effects. Edit: Thanks to Khyron for catching some of my mistakes. This should all be correct now and usable for most electrical networks, though I'd recommend using the equation I posted later on this page if you really want to be perfectly accurate. Last edited by Fraktal on Tue Aug 05, 2014 11:03 am, edited 3 times in total. Very cool. So the proportion is around 6 solar panels - 7 accumulator. I just made a perfect radar array. In practice, the numbers a bit off, especially for small networks. A radar requires 300 kW of power (0.3 MW). Using the mentioned equations, it needs 7.14 solar panels and 8.4 accumulators to function. 7.14 is an absolute minimum, so I had to round up to 8 solar panels. This has the effect of powering the radar later into the night, reducing the number of accumulators required. 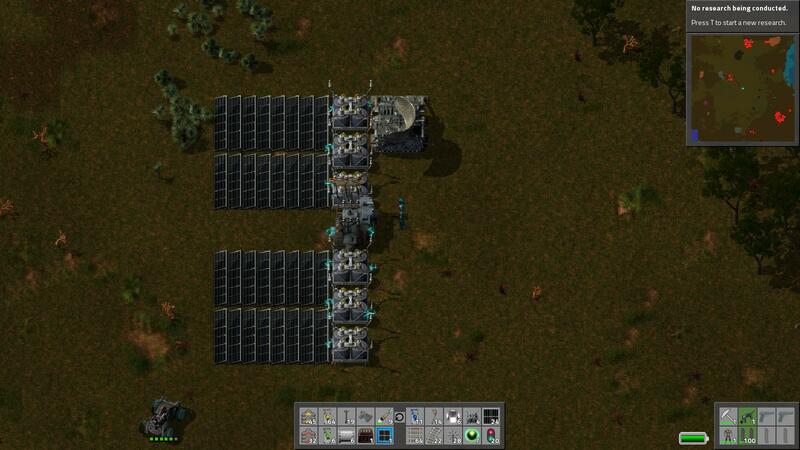 In the end, this design worked flawlessly, using 8 solar panels, 6 accumulators, a radar, and a substation. Wait a minute, your numbers don't seem to match there. You need 7.14 solars and 8.4 accumulators, yet you only built six accus? Is there something I am missing? Last set of mathematics. I've solved for the exact optimal number of solar arrays and accumulators for any network. The only input needed is still P. The units of P are MW. Round n_s up to the nearest whole number, since n_s is the minimum number of solar panels. Round this up too, since it is the minimum number of accumulators. And there you go, an optimal real system of solar panels and accumulators for any network. For a radar, n_s is calculated at 7.14, which rounds up to 8. Using n_s=8 in the second equation, n_a is calculated at 5.62, which rounds up to 6. That is why that electrical grid uses 8 solar panels and 6 accumulators. If anyone wants an explanation for that last equation, I can provide it. Edit: One thing I just found out is that radars do not use 300 kW of power, they use 309 kW (?). This isn't significant enough to change the blueprints, but it might be worth noting. Last edited by Fraktal on Mon Aug 04, 2014 11:24 pm, edited 1 time in total. Ah, I wasn't doubting your math, I was just wondering why did you say that it <i>needs</i> 8.4 accumulators to function. Now that I'm reading it again, it appears to be for a perfect solar network, not for the needs of a radar station. Nice math. I tried it and the accumulators hit 443kJ minimum before starting to charge again. But... the symmetry! Fraktal wrote: ...0.43P*0.7*416.66 = 140*P seconds. I think there's a small mistake here. I get 125.4P second. Fraktal wrote: though they are at full power for only 52s during the night. The only time accumulators provide P is for the entire duration of night, which is 41.66 seconds, no? Which if we plug in to your formula is 100 * P / (5 MJ) = 100 * P / (5 MW) = 20P / MW. Forget P, just use 42 kW, the average daily production of one solar panel. DaveMcW wrote: Forget P, just use 42 kW, the average daily production of one solar panel. That's fine if you know how many solar panels you need, but you need P for that anyway so I guess it doesn't really matter. I guess there's two ways to approach it from a construction point of view. One is to build N cookie-cutter panel-accumulator sets which implies a certain ratio. If you know the ratio you can design the cookie-cutter template, and your way is the easiest way to calculate the ratio. Alternatively you could build a stand-alone bank of N solar panels and M accumulators independently, in which case P is useful to calculate M or N from scratch. 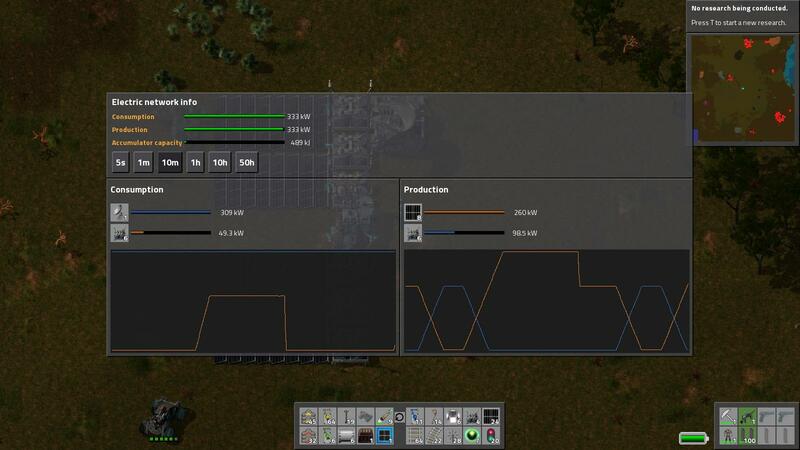 Using the radar example, with 8 solar panels needed, this gives 7 accumulators. One more than what is really needed. 7.14 solar panels times 0.84 equals 6 accumulators. You're right, I'll fix that right away. That was actually supposed to say 42 (rounded from 41.66). I'll also correct it in my opening post. This also all seems correct. This was actually the method I used to find the equation I put into my last post. I did find it a bit odd that it was so far off from the previously calculated ratio. Not sure if the calculations are right. I use 21 Accumulators to show it where the ratio give both sides the smallest integer for the outcome. 21 Accu's produces 840 kW in the night time (21x5000 kJ/125 secs) = 840 kW. There's no such thing as a perfect accumulator ratio thanks to Laser Turrets. Biters can attack at any time. If they attack during the day you can absorb it with solar power, but a night raid can only be survived with extra accumulators. In short, build extra accumulators. This is the correct way to do it : viewtopic.php?f=5&t=5594. This is a bit of an archived topic. Cilya and I have essentially the same results approached from different directions. His final ratio was 100 solar panels to 84 accumulators, or 1.19 solar panels per accumulator. My ratio was 23.8*P solar panels per 20*P accumulators, or 1.19 solar panels per accumulator. We're either both correct or both wrong. This is the false result. Just tu make sure nothing changed, I did a test this afternoon with 1000 solar panels, 840 accus, and 140 radars, and the 84 accus for 100 solar panels showed to be as accurate as it has been for as long as I can remember. Cool, thanks for testing that. Maybe I should edit the wiki with this info.